My best friend and the love of my life Chris Squire will be cremated today in Scottsdale, Arizona at 3:00 pm. However, knowing Chris, he might be running a bit late for the event; After all, he has always been the 'late' Chris Squire. 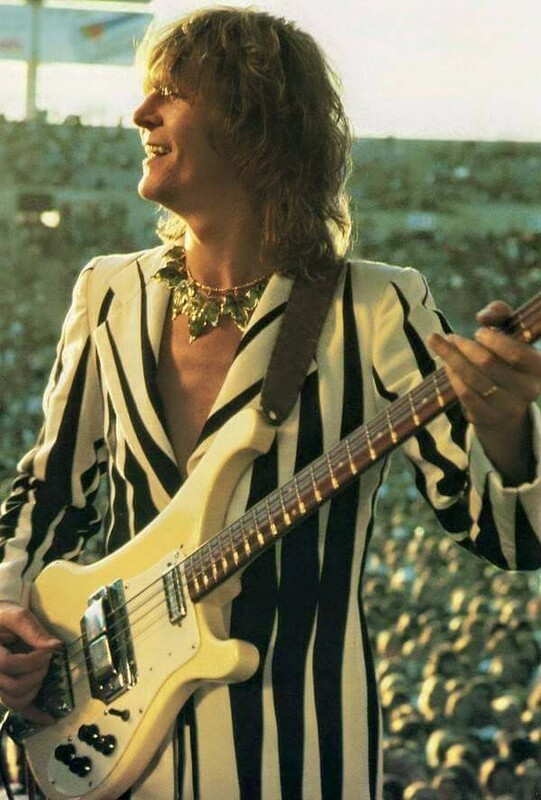 So at 3:00 pm Phoenix time, please take a moment to play your favorite Yes or Chris Squire song, or just think of your favorite Chris Squire memory. I knew, like many of us, that Chris was seriously ill with a rare form of leukaemia, but had heard the encouraging news that he was responding well to treatment and so felt optimistic that with treatment, love and prayer, he would beat it. Ironically I wrote to Paul Silveira, (the manager of YES), on Friday evening to enquire how Chris was and heard the desperately sad news yesterday. The phone has not stopped ringing and my inbox is overflowing with tributes from so many people which simply shows the effect that his contribution to music made to so many of us, musicians and fans alike. We have now lost, who for me, are the two greatest bass players classic rock has ever known. John Entwistle and now Chris. There can hardly be a bass player worth his salt who hasn’t been influenced by one or both of these great players. Chris took the art of making a bass guitar into a lead instrument to another stratosphere and coupled with his showmanship and concern for every single note he played, made him something special. Although Chris is no longer with us in human form, his music has not gone with him and that will be around long after all who read this will also have departed this mortal coil. That’s the great gift of music. That gift can be passed on with what has been created and so Chris will always live on. I, like all of you, send my heartfelt condolences to all Chris’s extended family and may there be some solace for them in knowing the impact he had on so many of us. Chris’s passing, truly marks the end of an era. Chris was a very special part of my life; we were musical brothers. He was an amazingly unique bass player - very poetic - and had a wonderful knowledge of harmony. We met at a certain time when music was very open, and I feel blessed to have created some wonderful, adventurous, music with him. Chris had such a great sense of humor... he always said he was Darth Vader to my Obiwan. I always thought of him as Christopher Robin to my Winnie the Pooh. We travelled a road less travelled and I'm so thankful that he climbed the musical mountains with me. Throughout everything, he was still my brother, and I'm so glad we were able to reconnect recently. I saw him in my meditation last night, and he was radiant. My heart goes out to his family and loved ones. I am about as sad as I could be. You all I'm sure know by now that Chris has passed. I spoke to him about a week ago, and we were still laughing together. Even though he had recently taken a turn for the worse, this was not totally unexpected, and the shock and sadness is extreme. I will miss him terribly. We have all lost a giant musically and a wonderful guy. He was (to put it lightly). THE REAL DEAL. One of a kind with no equal. I can't get him off my mind. I have so many wonderful memories of working with Chris and many of those in recent years. We once spent an entire journey after a gig trying to remember all the lyrics to 'my ol man's a dustman' - we eventually gave up on that one! I'll miss seeing him looking across the stage - a wink here and a wink there with that Mephistophelean grin particularly if something had gone slightly awry. He was a legendary bassist, loveable funny guy both on and off the stage. He took bass guitar to another level and inspired thousands of others, the undisputed king of the 4 strings. Many will cite Chris as the reason why they picked up the instrument in the first place. We became close over the last few years, and spent a lot of time together socially as well as on the tours. He was always greatly entertaining with his countless tales of rock and roll, and his own personal spin on life. Despite his imposing figure, he had a really soft, gentle and charitable side. Always magnanimous to band, crew and fans alike. Although essentially captain of the YES ship he displayed very much a laissez-faire attitude towards the band and a nonchalance to life in general. I am eternally grateful that he was a great advocate of my playing and encouraged my own musical contributions. I learnt an enormous amount and gained great confidence from his support. Many of the funny stories were from airports. His lateness was famous. Back on the Drama tour, we had a private jet and suitcases were always collected early from outside hotel room. Chris had somehow packed his trousers and shirt, turned up at the airport and got on the plane wearing just a long jacket and underpants. 'Sorry I'm late' he said, without the slightest hint anything was untoward. Another time we were all waiting to go on stage and - no Chris. Thus followed a panic to find out where he was. He had apparently fallen asleep in the bath and had to get the fire marshall to break down his hotel room door. We ended up taking the stage an hour late, with Chris arriving asking 'is there a problem'? But one thing for sure is that he always delivered. The stage was his world. His attention to the minutest details of the music was immense - you certainly couldn't get away with playing the wrong inversions of the chords anywhere, or anything out of line. He would come over with his inimitable casual fashion and point out ’that’s not quite right’. As a person he loved life to the full - a glass of wine, fine food, tennis, motor racing, and an enthusiast for everything musical. His thunderous bass rig with the sub Taurus pedals rattling the stages was legendary - the ‘wall of doom' as it was known housing some 30 speakers dominating an entire side of the stage. He was one of the few bassists who had the audacity to pick up a triple-necked instrument without the slightest hint of irony, and, probably the only one who could actually play the bloody thing! A musician’s musician. A genius. I'm going to miss him greatly. It’s hard to imagine the future without Chris! I sense that he will be in our thoughts & minds for sometime. He was a one-off, larger than life human being, who brought a serious amount to everything he was part of. Long may his memory resonate through the lands. The news of Chris' passing is very sad. He was a special friend and a phenomenal musician, always eager to go beyond the outreaches of creativity. During my years as a member of Yes and even outside of the band, strongly embedded in my memory, are some of the extraordinary sessions we used to have together; like an 'empathy of minds and souls' jamming together to the rhythms of frequencies, all distances abbreviated by the pure spontaneity of spirits roaming freely, all barriers seemingly abolished! My deepest heartfelt thoughts and condolences go out to Chris' family and loved ones. This has to be the hardest message I've ever written, I'm devastated losing Chris. I met Chris in 1987, we became fast friends and remained so through all these many years. He was a big part of my world. He was my hero, playing bass and singing the way he did was such a huge inspiration. We made a lot of music together over the years, for which I'm eternally grateful. It was always something very special indeed to create with Chris, we seemed to always be on the same page with our ideas, Chris used to say to me 'I guess it's because we are both Pisces, our music always has a watery sort of vibe to it' (I can hear his voice in my head as I write). I went to visit with him (just before he fell ill) in Arizona, I got to spend time with him and his wonderful Family, we had an amazing dinner and many laughs together. Chris came to my hotel to record a bass track on a new record I'm making called 'CITIZEN' and he nailed it in classic Squire style. 5 String in hand, playing great, with the amazing grin on his face. He was in the zone, little did I know at the time he was facing the battle that would eventually take him from us all. From that conversation forward we we're speaking on the phone about the various nuances of the music, bass parts etc... Just last week or so... he phone and for some reason the tone and tenor was different. It was as if he was the father telling his son a final farewell, cloaked in an upbeat voice and manner but never the less. This would be the final conversation we would have. My heart is broken for losing my friend, for his family's loss and the many many fans I know loved him. Chris said to me, 'play the music, be yourself and make me proud'. It's my true desire now live up to his wishes. He will forever live on in my heart and I will miss him terribly.